Get to know Downtown Vancouver a little better this summer through its shopping, arts & culture events, food and entertainment! Yesterday you got the chance to win Brunch on Granville and today, for the second stop on this digital, virtual tour, we visit Hastings West. Hastings West is a distinctive sense of place and arrival. Its stimulating juxtaposition of the old and the new; the established and the unconventional. 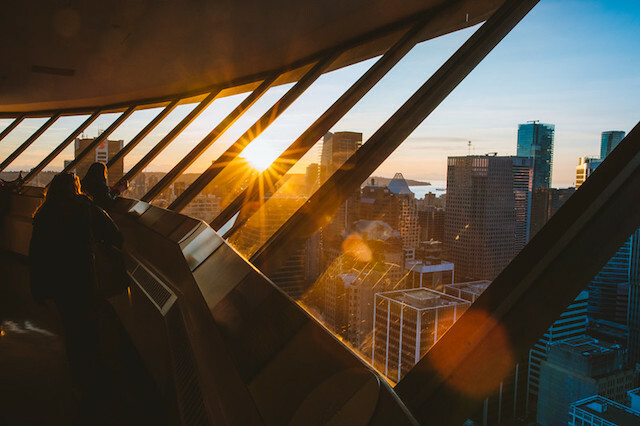 It’s home to stunning architecture, like the iconic Marine Building, and epic views, from the top of the Vancouver Lookout. It’s also a walkable and bikable corridor with connections and bike lanes. Hastings West is home to the Downtown Vancouver BIA’s first Perch, Lot 19 which provides the many office workers along the street an opportunity for respite. Lot 19 is sandwiched by the Vancouver Club, Terminal City Club and Mink Chocolate and acts as a thoroughfare between Hastings and the Waterfront. You may even recognize it from many Vancouver-filmed TV shows and movies. It is activated with public seating, buskers, games, and a variety of special events. Thanks to the Downtown Vancouver BIA, a lucky Miss604 reader can spend the day wandering, exploring, and savouring the sights and good eats along Hastings West. Here’s how you can enter to win all of this! Follow Downtown Vancouver BIA on Facebook, Twitter, and Instagram. Keep your eyes on Miss604 and the Downtown Vancouver BIA for even more great contests this week. I will draw one winner of the Savour West Hastings on Wednesday, July 25, 2018 at 12:00pm. Update The winner is Melissa Teresa! Oh come on – your contests are incredible!! Would invite my 6 yr old granddaughter to enjoy drinking chocolate at Mink, date night with hubby to Nightingale, tea at Murchies with best friend of 40 years, and Vancouver Lookout outing with my 4 yr old grandson. We live in an incredible city! I would to win this lovely prize! Thanks for the contest! What a wonderful evening out to explore the town! Great prizes! Crossing fingers😁 thank you for the opportunity to win. Ohhh this sounds like a great prize! How often do we get a chance to be a tourist in our own city!? Coffee, chocolate, food and a view! What an excellent prize! I studied for two years in the Harbour Centre building, never made it up the Lookout! Would love this prize. What a great way to see the city! This sounds like a wonderful way to spend a summer day! Thank you. Would love some quality time with my husband. Great prizes, Mink Chocolate makes amazing stuff! This would be so wonderful! I’d love to see all these places! Thanks for the chance to win. Crossing my fingers! I adore Mink chocolate, and would love to try the other places too! It would be fun to spend the day exploring Hastings West! I would love to win this prize, as I’m relatively new to Vancouver I would like to,get to know this area downtown! This would be a great contest to win. Would love to win to try out these places! Twitted also @drama_otaku. What a lovely prize package! Thanks for the chance! Exciting!!!! Unreal prize! Would love to have a chance at winning! Woo!!!! Sounds awesome, and very tasty! Sounds like a fun evening out! 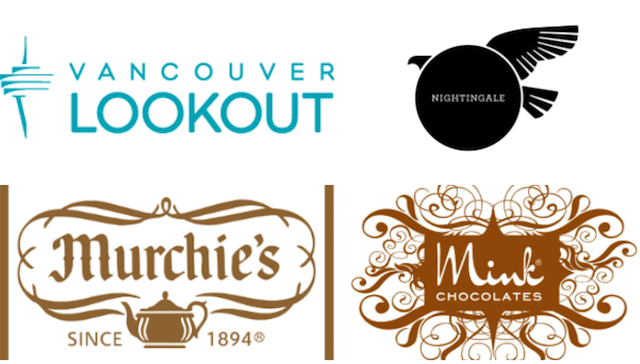 My son would love the Lookout and I would love the Murchie’s and chocolate and Nightingale looks amazing! This would be a nice addition to our staycation!! Would live this! Work in area, but have never been to these places! Except Murchies. Cream of Earl Grey tea is amazin! Wow! Awesome places. A little vacation in the city. Mink has the best hot chocolate & mochas. Would love to try Nightingale. this is a great date night prize….is it valentines day already? Winning this prize would be awesome! Thanks! Love all the little parks and seating areas on Hastings West. Such a fun prize package. So much fun! That would be an amazing day spent with my hubby! What a great prize! The Lookout tickets would be perfect for our out of town guests coming in August! Fantastic prize pack! You had me at Murchie’s!!!!!!! Amazingly (or sadly!!) I live downtown and have never been to ANY of the places in the prize pack!! Thanks for the opportunity!! Awesome!! I’d give the Murchies prize to my partner – he only gets tea from there and loves their Paris Afternoon tea. And we’ve never been to Nightingale – sounds like a date! I love Murchies and Mink Chocolates. What a great afternoon! Wow, what an amazing prize pack! Wow, what a great prize – thanks for the chance to win! I’d love to win this pls! What an awesome date night this could be! Great prize pack and conveniently in my neighbourhood! This prize pack would make for a fun downtown day with my wife! Ooh I’ve heard amazing things about Nightingale and would LOVE to try it out. Thanks for the opportunity! I just moved back to BC after 8 years abroad so I would love to win this gift to rediscover my city! This would make for a great date! How cool! I’ve never had a chance to go to the Vancouver Lookout! AWESOME PRIZE!! I’ll take my mom. Thanks for having these contests. Would love to take the time to explore my own city more. I have heard the food is excellent at Nightingale & would love to try it. Hope you pick me. Fantastic giveaway! I have never been to the Vancouver Lookout, it would be great to go! Another great giveaway! Thanks for the opportunity. this would be so fun to do downtown one day! This would make a great day out. Would love to share this prize with a soon-to-arrive visitor coming from out-of-town! Would be nice to check out Nightingale and the Lookout’s vegan options. Great experience being a Vancouver tourist. I would love to dine at Nightingale! Thanks for the opportunity and the awesome prize! What a lovely prize pack! Thanks! Wow what a prize this is, thanks for putting this up! This would be a dream prize,,,wow great! Hastings W is always unique! OOh I love Mink and would love to spend the day exploring and eating in the area! The best! Downtown BIA doing a great job in promoting our city. What a great way to celebrate GRAD with my mom for everything she has done for me! Oh I love Mink! Would love to win this prize pack. Hastings West has become such a vibrant area. This would be an amazing way to spend a weekend in Vancouver! Lovely prize pack! Would love to share this with my husband! Amazing prize pack! Would love to take my wife on a date in Vancouver! Lovely place to be, I used to take my morning run around downtown, there is always something happening. Miss604, I don’t know how you keep putting together these awesome contests. But, thank you!!!! This would be a great prize and summer break! This giveaway is so good!!! Nightingale is supposed to be amazing, and Mink is really something. So yummy! Lovely fun prize! Thanks for the chance! This giveaway sounds like a great treat! This would be wonderful! Thanks for the opportunity! As I am in town this summer I would love to be a tourist in my hometown. Thanks. This would be awesome… I’ve always wanted to try Nightingale. What a great excuse to explore the neighbourhood! Nice! Mink chocolate is so good! What an awesome prize pkg! Thx for the chance. Thanks for the opportunity to do this. I have been wanting to take my girlfriend to some of these places but I can never afford to do it. I wish everyone the best of luck with this. This would be an awesome day! what a great bunch of goodies to win! This is amazing! Thanks for the opportunity! This would be the Perfect Night out with my husband! I love Vancouver! Wow- what a great prize! Lovely way to savour summer! I love to win this to know more about Vancouver ! I’d would be great to spend some time downtown! Thank you for putting this contest together! I’ve never been to the Vancouver Lookout, so if I were lucky enough to be picked, this would be a great opportunity to finally visit and experience the views from the Vancouver Lookout! Awesome Prize! Thanks for the chance to win! Oh me me pretty please! We could use a mommy daddy date night out!!! Thanks for the chance to win! !